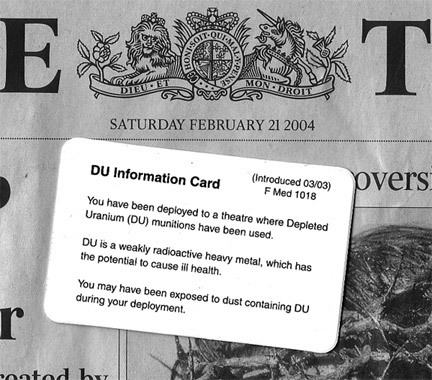 You have been deployed to a theatre where Depleted Uranium (DU) munitions have been used. DU is a weakly radioactive heavy metal, whch has the potential to cause ill health. You may have been exposed to dust containing DU during your deployment. you should consult your unit medical officer on return to your home base. Your medical officer can provie information about the health effects of DU. British Troops serving in Iraq are now being issued with an F Med 1018. Why not before the Iraq war, Balkans or Gulf War? Are service personnel from other nations aware that British Troops carry this warning card? Are Iraqi Civilians aware of this warning card? Are Civilians aware of this warning card who around the world live near test firing range's. Copies of this card should be made for the Iraqi civilians to turn up at British & American Military establishments in Iraq and ask for testingas it was the US and the UK that used Uranium Munitions. Please distribute the faxed, photo-copy of the card that was sent to me. It was said that DU was experimental during Gulf War 1 - then is this another demonstration of the breaking of the Nuremberg Code by observing the health effects on the Veterans after the War? A description of the MoD policy - dated January 2003 - calls for one mid-stream sample. Dr. Durakovic [ Uranium Medical Research Center ]has said that a 24 hour sample is necessary. So, would the test referenced on the card be 24 hour or only a spot test? test too,.and that would show compliance with pentagon October 1993 medical directive. Then there is the competence of the laboratory to provide correct results. A slip up at any point could lead to "wrong information".